Former Chongqing Party Chief Pleads Guilty to Bribery in Scripted Trial - Integration Through Media ....! A former top ruling Chinese Communist Party official pleaded guilty to bribery at his heavily scripted trial in the northern city of Tianjin on Thursday. 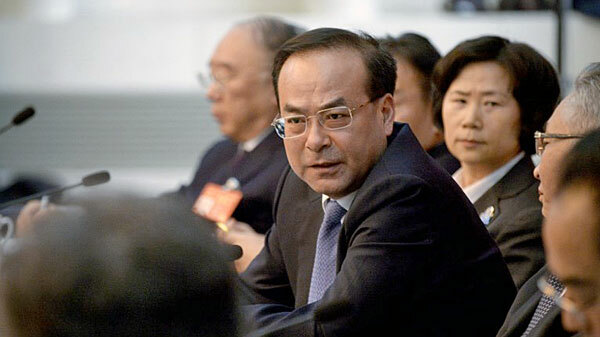 Former Chongqing party secretary and Politburo member Sun Zhengcai stood trial at the Tianjin No. 1 Intermediate People’s Court, state media reported. Sun admitted to taking advantage of his posts to seek profits for others, as well as illegally accepting huge amounts of money and property during postings to Beijing’s Shunyi district, Beijing’s municipal party committee, Jilin province, while serving on the 25-member Politburo and as Chongqing party chief. “Between 2002 and 2017, Sun took advantage of his posts to provide help for certain units and individuals in project procurement, enterprise operation and adjustment of official positions, and accepted money and property worth 170 million yuan (U.S. $27.1 million,” state news agency Xinhua reported. “I am seriously guilty of violating [party] discipline and the law, and I have been given a solemn judgment by the law,” Sun told the court in footage aired by state broadcaster CCTV. A senior official has said that the investigation into Sun was sparked after authorities discovered his involvement in a “conspiracy” to overthrow President Xi Jinping. The chairman of China’s securities regulator Liu Shiyu told a meeting of top finance officials during the 19th party congress last October that the once-rising political star had plotted to seize power from the current leadership. Grassroots anti-corruption campaigner Ma Bo said that corruption is still rife in China, in spite of a nationwide anti-corruption campaign waged by President Xi Jinping since taking power in 2012. She said Sun’s trial doesn’t mean that the daily problems of ordinary Chinese citizens are being dealt with by the ruling Chinese Communist Party. She said the current campaign remains selective. “A genuine anti-corruption campaign would go after anyone found to have engaged in corrupt practices, regardless of who they were,” Ma said. Writer Tie Liu, who was once classed by the Communist Party as a “rightist,” agreed, saying Sun was more a victim of internal power struggles within the party than the target of any genuine clean-up campaign.